Nano fish are quickly becoming one of the most popular categories of fish kept by hobbyists. Aquarists have become fascinated with the idea of moulding a miniature world that fits well in the confines of a cramped room or apartment. Nano tanks are tanks that are typically smaller than 10 gallons, and in most cases, house saltwater invertebrates and fish. These nano tanks, while a bit less forgiving when it comes to water parameters, are much easier to clean and require cheaper equipment, all while still being able to hold a plethora of beautiful plants, corals, and fish. While nano tanks are usually saltwater, there’s been a rising demand for freshwater nano tanks as well, and with that surge of interest comes a fresh pair of eyes for the a bright freshwater nano centrepiece – Scarlet Badis. Scarlet badis is a small fish that comes from India. Typically found in clear and shallow rivers with a rich, lush aquatic plants, scarlet badis will enjoy a well-kept planted tank. Male badis grow up to around an inch long, with the females growing up to a little over half an inch. Scarlet badis have a rich red coloration accented by vertical metallic green stripes. Unfortunately, these vivid color patterns are revealed during adulthood, and since many pet shops sell scarlet badis juveniles, one often sees them in a drab, grey state – like a cross between a mosquito fish and some random cichlid. With a little time and care, however, they make a worthy aquarium centerpiece. There have been mixed reviews regarding scarlet badis, with some aquarists reporting that they’re quite timid and can be outcompeted by other more active fish for food, while other aquarists report the scarlet badis becoming a bit hostile towards other tank inhabitants. That being said, it helps to put things into perspective first instead of assuming that the scarlet badis will behave the same way in every environment with every fish. The next section talks about the tank environment suited for the scarlet badis. Nano tanks and difficult fish are often a bad combination, especially for beginners. For the scarlet badis, one has to take into consideration the increased aggression that comes from being in a smaller, more cramped space, as well as the quicker build up of biological waste. Oftentimes, the smaller the tank and the more crowded it is, the more hostile the scarlet badis becomes towards other tank mates. The aggression becomes exacerbated with lack of thick aquarium plants to break its line of sight. That being said, the ideal nano tank setup includes having a scarlet badis couple or group that consists of 1 male and 2-3 females. A 5 gallon tank will often be enough to house them, but a will be much more stable and forgiving for beginners. Either way, it should be heavily planted, as plants, in general, as well as driftwood, tend to make fish feel safer because they act as shelters that tinier fish can dart into in times of trouble. Ironically, having a lot of possible hiding places for the scarlet badis results in them being more confident with swimming out in the open. A dechlorinator removes chlorine from tap water, which is important since chlorine is extremely toxic to fish. Adding tap water straight into a tank not only endangers the fish, but it also kills the beneficial bacteria that breaks down toxic ammonia and nitrite to the less toxic nitrate. If you plan on using tap water, make sure you buy a quality dechlorinator. Filters strain out waste from the water so that it uneaten food and other nasty, decaying matter are removed before they start to decompose in the tank. Apart from this, they also aerate the water by breaking the surface of the water and allowing a constant exchange of gases. For nano tanks, it’s generally advisable to go with hang-on-back filters, since they save a lot of space while also providing enough room for all kinds of filter media you might want, from filter floss to carbon. LED lights produce much less heat, therefore causing less temperature fluctuations in nano tanks. If you’re on a budget, you could even go with LED floodlights with 6,700k color temperature, with a wattage of 10-20w, depending on the plants you plan on keeping. Purple-leaved plants and carpet plants generally require more intense lighting, as well as additional carbon dioxide. If you only provide intense lighting without the additional carbon dioxide, you may end up with a surplus of algae. If you’re a beginner, you’ll want to go with less wattage of light and easier plants to avoid a possible burst of algal growth. 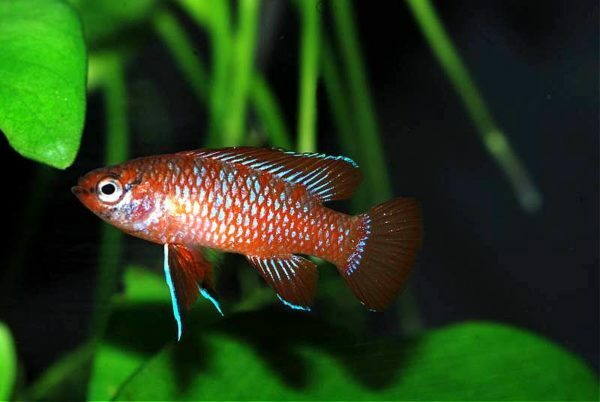 If you plan on keeping scarlet badis in tanks less than 5 gallons, you’ll need to employ more advanced aquarium fishkeeping techniques and equipments to keep the water quality high. While not recommended, you can still get away with a smaller tank by doing more frequent water changes (50% every other day for heavily stocked tanks), as well as adding more expensive filter media like Seachem’s Purigen. Take note, however, that while there are much more advanced equipment available today, they don’t necessarily make it okay to subject scarlet badis to an impossibly small tank, such as 1 liter. The absolute minimum that you can keep a scarlet badis in is around 3 gallons, and that’s pushing it. For food, since scarlet badis thrive on insects and their larvae, you’ll want to feed it a wide variety of live food, from bloodworms to daphnia. A regular assortment of food will keep it happy, healthy, and curious. Scarlet badis are gaining momentum because of their beautiful, vivid adult colorations. Not a lot of beginners are willing to take a chance on such a drably colored juvenile fish in a pet shop, which means that they have relatively low demand, and as a consequence, a much lower price tag. If you have the patience and the time, the scarlet badis is a bud whose bloom is worth waiting for in your aquatic garden.